Mobile marketing refers to the process of marketing products and services with the help of a mobile device like a cell phone. Using a cell phone in marketing is known as SMS marketing. Mobile marketing can also be defined as the process of using mobile medium in marketing or the process of distributing any advertising or promotional messages to present and prospective customers with the help of wireless networks. A lot of experts in the marketing industry also define mobile marketing as the act of utilizing interactive wireless media as a means of providing present and potential customers with personalized and location and time sensitive information which aims to promote goods, ideas and services while also allowing stakeholders to generate value. It is also proven to be a set of practices which allows a specific organization to engage and communicate with their target audience in a more relevant and interactive manner since a more automated network or mobile device is used. If you are thinking of getting a mobile marketing certification with an aim of gathering enough information about the process, then you have to keep in mind that there are tools and concepts that you need to use in successfully carrying it out. These include unstructured supplementary service data, multimedia messaging services, mobile applications, social media and mobile internet, infrared, wireless and Bluetooth. Mobile marketing is a good way to market all your products and services because aside from allowing your present and prospective customers to reach you by connecting to the internet through PDA, a cellular telephone and any other gadget, mobile connectivity also gives you the opportunity to consolidate various channels for communication in a simpler and more effective medium. It is also proven to be less expensive than the other types of marketing campaigns. The mobile marketing certification program from Brainmeasures is your best choice if you want to gather enough information about how you can make the mobile marketing process work to your greatest advantage. Brainmeasures is an online certification company certified by ISO and is popular for being able to supply the students of all its certification programs with relevant and authentic information about their chosen fields. A more reliable and comprehensive type of training is also something that you can expect to receiving by enrolling in the mobile marketing certification course provided by Brainmeasures. The entire program together with the online marketing exam which is included in it is also created by experienced and professional mobile marketers so gathering all the information that you need about the field will never become impossible. The certification program will also allow you to learn how to effectively undertake the mobile marketing management process. 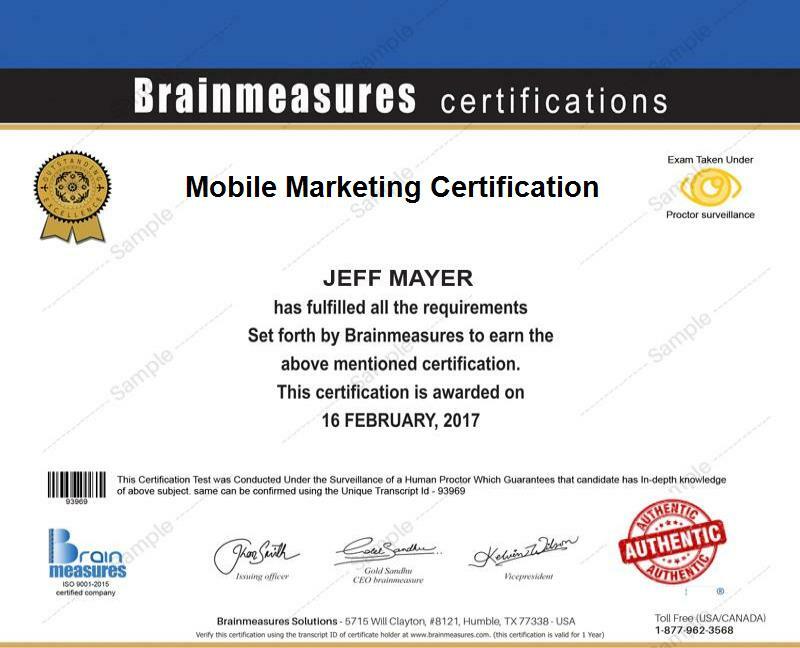 The mobile marketing certification program from Brainmeasures is proven to be so detailed that you will be able to gather all kinds of information related to mobile marketing. Brainmeasures gives you the opportunity to view its detailed syllabus after you register with the site and log into your account. Here is a short list of the specific topics that the Brainmeasures mobile marketing certification program can offer. The mobile marketing certification program can benefit numerous professionals who are working in the marketing and advertising department of an organization. This is the best course for you if you are planning to improve your sales or the sales of the organization which you are working for by effectively carrying out mobile marketing campaigns. If you are already a holder of a mobile marketing certification, then you no longer need to worry about being unable to receive a substantial amount of income since experts in mobile marketing can receive a more desirable pay. You will be able to earn around $87,000 to $119,000 once you start to practice your expertise in the field.